Rice dishes are among our favorites; they are always tasty and easy to prepare without having special cooking skills. Back to School time is already here and we are always looking for ways to make our transition from summer adventures to fall classes easier and smoother. Our big family is always busy with travels, physical activities and educational programs, and we do not always have time for cooking hot meals. We have already appreciated the fast and easy instant Minute Rice when camping and living in a tent during summer time. This fall Minute Rice introduces Ready To Serve Cups just on-time for busy Back-to-School season. They come in six delicious varieties Basmati, Whole Grain, Oriental Style, Vegetable Medley, Long Grain & Wild Rice – Fine Herbs, Long Grain & Wild Rice – Chicken Flavour and Mexican to fit a wide range of tastes. Available as a sleeve of two 125 gram microwaveable cups, they need only one minute to be ready. Busy at school, no time to cook between activities, tired after hockey practice or no energy to cook after long work hours, convenient Minute Rice cups are here to help. The rice can be eaten straight out of the serving cup, as a side dish, or combined with chicken, beef, lamb, fish or vegetable for a quick one-dish meal. I like that Oriental Style, Long Grain & Wild Rice and Vegetable Medley because they contain additional ingredients like chicken flavour and vegetables, so they are final dishes ready to eat. If you want to use rice as a base for a meal and add your own ingredients, check Basmati and Whole Grain varieties which come as plain rice. If you have children at the college or university, Minute Rice Ready To Serve Cups are very convenient way to serve hungry students with healthy and delicious meal without breaking a bank, one sleeve is about $2.75, plus with discount coupon, it is going to be even less. 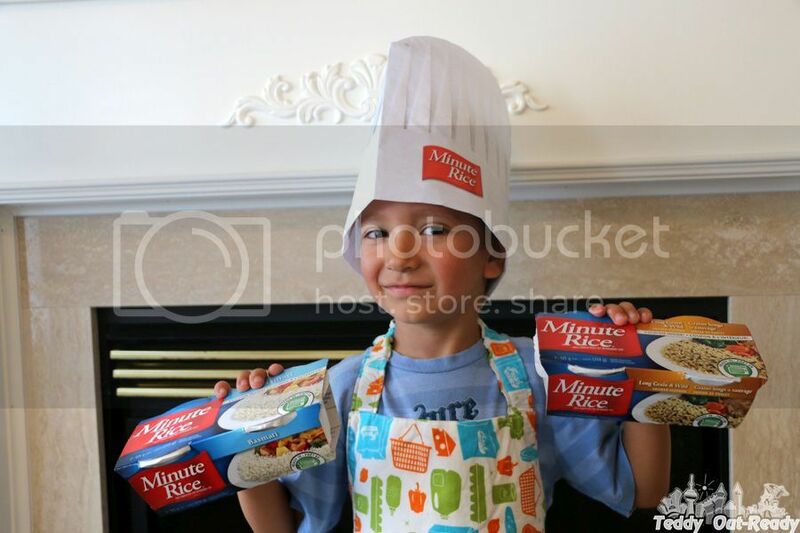 Another amazing benefit of Minute Rice cups is that you can cook fast and easy meals with your kids. 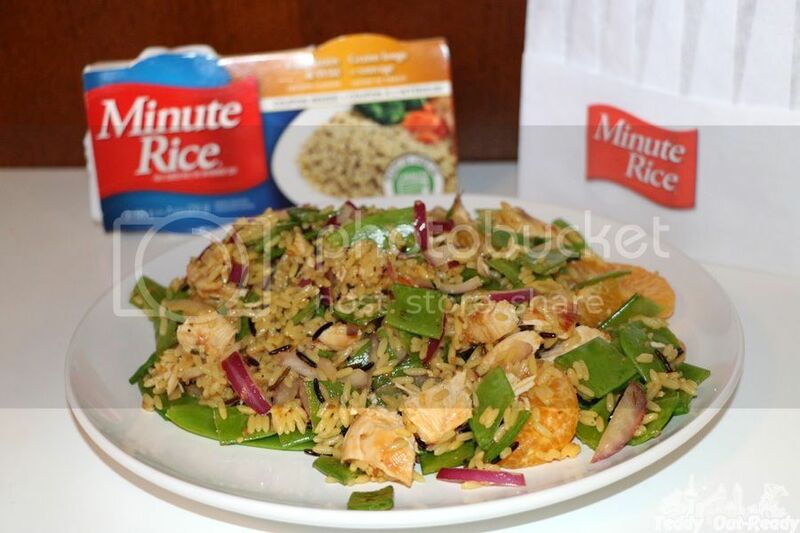 Minute Rice offers a bunch of great recipes and I tried some with my kid, for example Minute Rice Chicken & Wild Rice Salad. It takes only 20 minutes in total to prepare but it was fun being a little chef and serve the family with delicious salad. 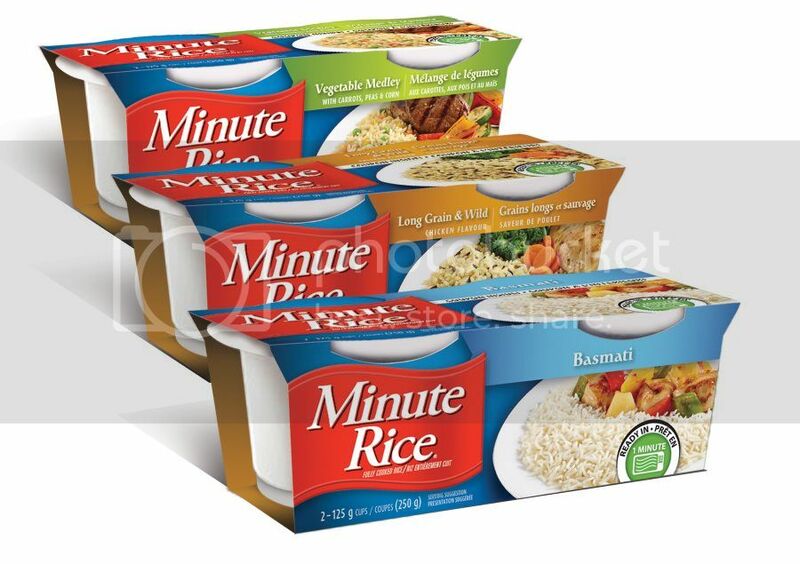 Heat Minute Rice® Ready to Serve Cup – Long Grain & Wild Rice – Chicken Flavour in microwave, per package instructions. Add diced chicken breast, snow peas and sliced red onion. Stir in mandarin orange segments and sesame orange salad dressing. More information and time-saving recipes can be found at http://www.minuterice.ca/prod_rts.htm. We are excited that Minute Rice® is offering one lucky Teddy Out Ready reader a chance to win three cases (48 cups – a $66 value) of Minute Rice® Ready to Serve Cups for themselves. Happy Back To School, everyone! I like the Basmati Rice. I would love the Basmati Rice! We enjoy the Basmati rice plain or with dressing on it. I'd really like to try the Long Grain and Wild Rice Chicken Flavour. I've tried the long grain and wild rice chicken flavour cups. They are my favourite! The Basmati is most appealing to me. So quick and easy and great to go along with a stir fry! The Long Grain & Wild Rice Chicken Flavour sounds good. The Long Grain and Wild Rice is the most appealing to me but they all sound good. The long grain and wild rice fine herbs flavours is the one that appeals to me the most. Basmati is most appealing to me. It is my favourite rice to eat. Minute Rice Ready To Serve Cups in Long Grain and Wild Rice is my favorite! The Oriental Style rice is the most appealing, although they all sound delicious. The Vegetable Medley sounds good. the long grain and wild rice chicken flavour cups sound so good ! The long grain ad wild rice,chicken flavor sounds delicious! Basmati is our fave so we would most likely try that one first! I would like Oriental Style! They all sound delish but I think I would try the Oriental Style first. Thanks for the chance to win! I'm interested in trying the Basmati Rice. Love the Oriental style rice the most! Long grain & wild rice - chicken flavor sounds good. I'd LOVE the Basmati rice! Oriental style Minute Rice cups sound yummy. The Vegetable Medley is one I love to try first! I'd like to try the Long Grand and Wild Rice -Chicken Flavour. It sounds yummy to me. I'd like to try the basmati rice most of all :) thanks for the chance! I'd really like to try the basmati rice...it would go with so many mains. The Long Grain and Wild Rice Chicken Flavor. I'd love to try the Long Grain & Wild Rice Chicken Flavour. I'm most interested in trying their Basmati Rice Cups. The Oriental style rice will be my first pick! Fine Herbs, Long Grain & Wild Rice sounds good. I would like the try the basmati. Huge fan of Basmati Rice! The Minute Rice Ready to Serve Cups flavour that is the most appealing to me is the Oriental style rice. The Long Grain & Wild Rice – Chicken Flavour sounds most appealing to me :) When I cook rice from scratch, and like to cook it in chicken broth for the added flavor - yum! I can see the Long Grain & Wild Rice Chicken Flavour being my favorite & quite versatile for a lot of dishes I prepare! like to try the Long Grain and Wild Rice Chicken Flavour. Basmati looks most appealing to myself. I'd have to say the Oriental style one. The Oriental Style is probably the most appealing, but i think i would also like the Basmati and the Vegetable melody.... and the long grain and wild rice. Ps. I like rice. I think the Vegetable Medley one! The long grain and wild rice chicken is the best!! yum yum!! I love the Basmati Rice. The Long Grain & Wild Rice – Chicken Flavour and Long Grain & Wild Rice – Fine Herbs flavours are the most appealing to me. I also think I would use the Basmati quite a bit. The vegetable medley sounds delicious! I love that it has peas carrots and corn. I love the Basmati Rice! For me, I would say the Long Grain & Wild Rice - Chicken Flavor, and then the Oriental Style!! Vegetable Medley sounds great too! With five kids, and with how exhausted I am by dinner, these would be AMAZING to have!! I'd love to try the basmati rice. The Oriental Style Rice is the most appealing to me. The basmati variety is my favourite. Oriental style was the one I was most excited to try!